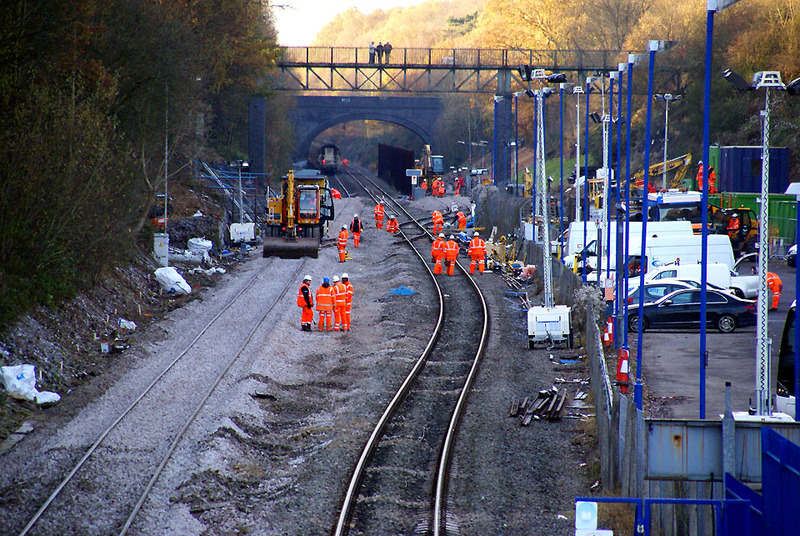 Compared to Neasden and Northolt, the work was relatively small scale in railway engineering terms. This page attempts to describe in pictures and limited text the work that was carried out. 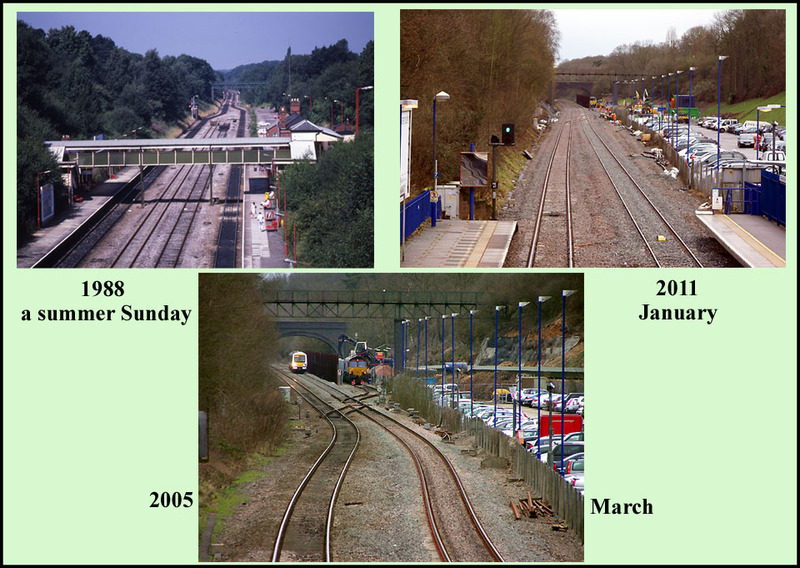 This collage presents some 23 years of change, but the track layout was changing before 1988, as is obvious from the first picture. The transition between 1988 and 2005 was accomplished in several stages, most of which do not need to concern us here, but the end result is now incorporated in the new faster and more flexible layout. So let us look at what controlled the background to Evergreen, and consider why the layout was in the shape it was prior to Evergreen. 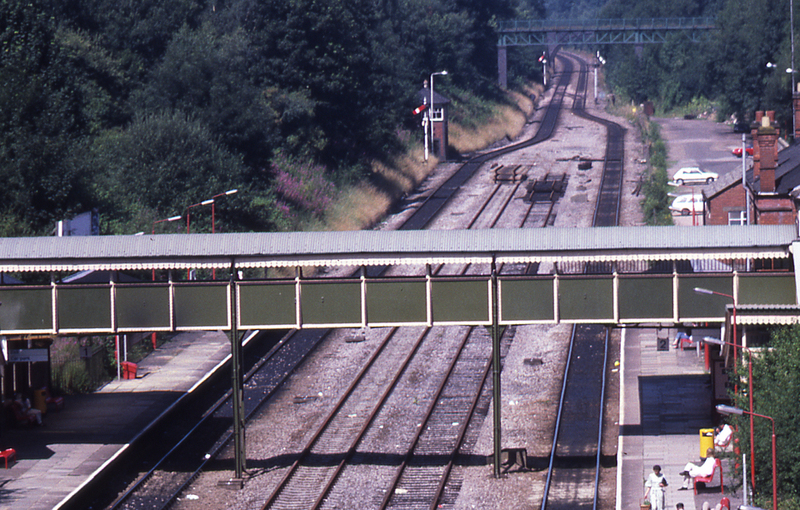 This layout to the west of Gerrards Cross, seen in 1988, was the economy version of the long-standing layout. 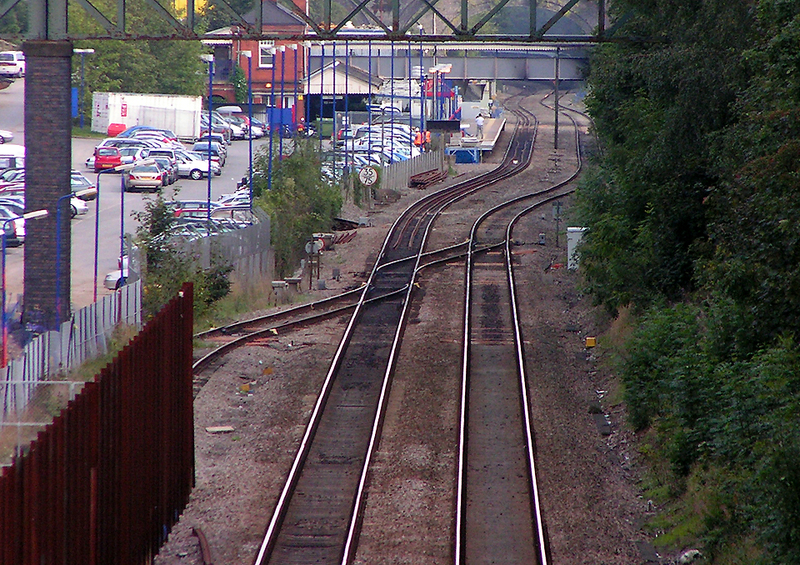 All the points had been removed, through lines that were once the fast route to Birmingham and on to Birkenhead are out of use. The original sidings, and even a cattle dock, have gone. There is no crossover. The signal box was switched out at weekends and would soon be gone in the Total Route Modernisation when colour light signals controlled from Marylebone were installed - one signal at the end of the down platform, replaced the two down semaphores seen here. The up semaphore went. But this was nevertheless a busy commuter station and car parking space was in short supply. 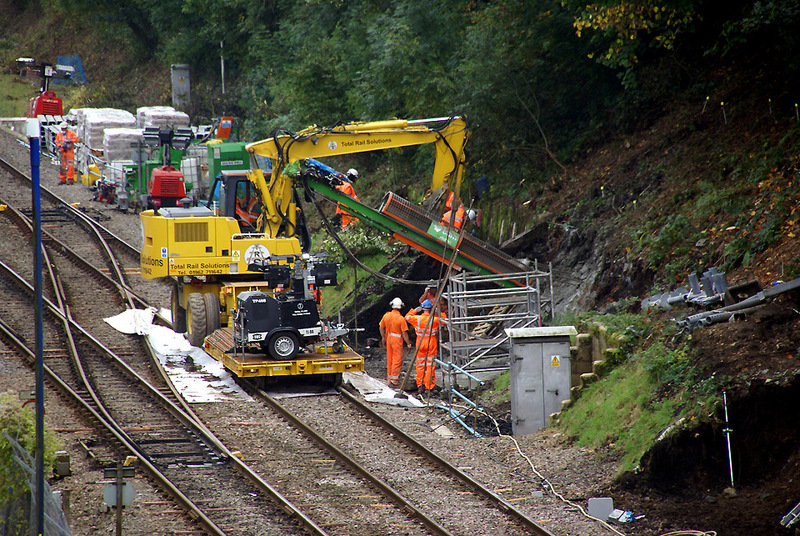 The solution was to connect the up line at the top of the picture to the down through line, and construct a new platform where the up main line is here. I do not know whether using the two through lines as platform roads was considered, but the footbridge stanchions would have been a problem, and less new car park space would have been created. A note on nomenclature - official railway documents refer to the line as having a north-south axis. Through the station the track is almost exactly south-east to north-west but for convenience those of us who live there think of it as being an east to west line. That is the convention I have used here. We will now fast-forward to 2005. 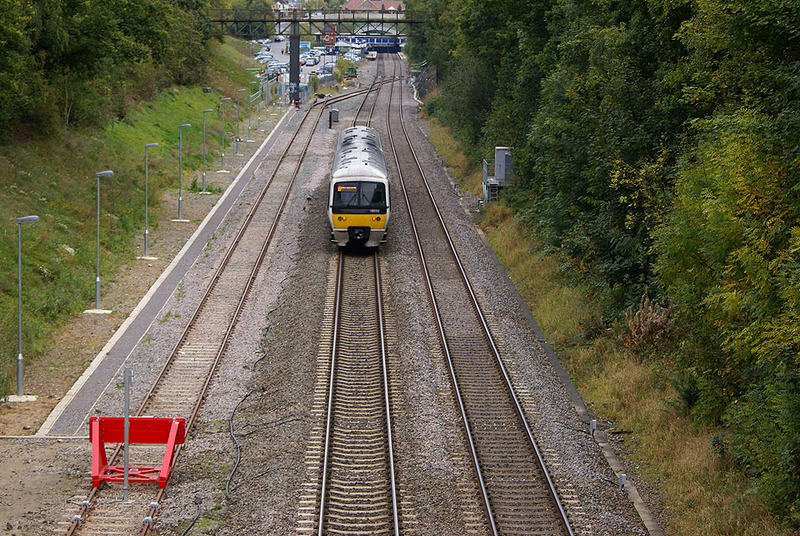 The curves at both ends of the station in both directions have been eased within the constraints of the platforms and the cutting to create a 75 mph layout. 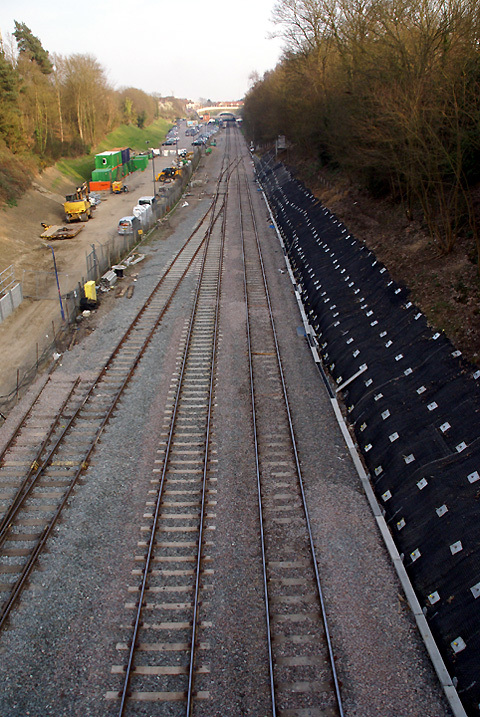 A facing crossover and a short turn-back siding have been installed, the latter on a long-disused siding formation. 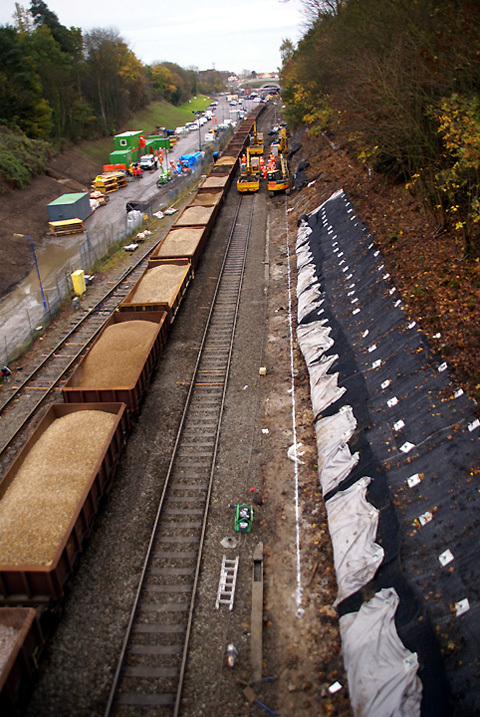 Then the Tesco tunnel development came along and the turn-back siding was lengthened to accomodate trains of 11 wagons and two locos delivering fill material. 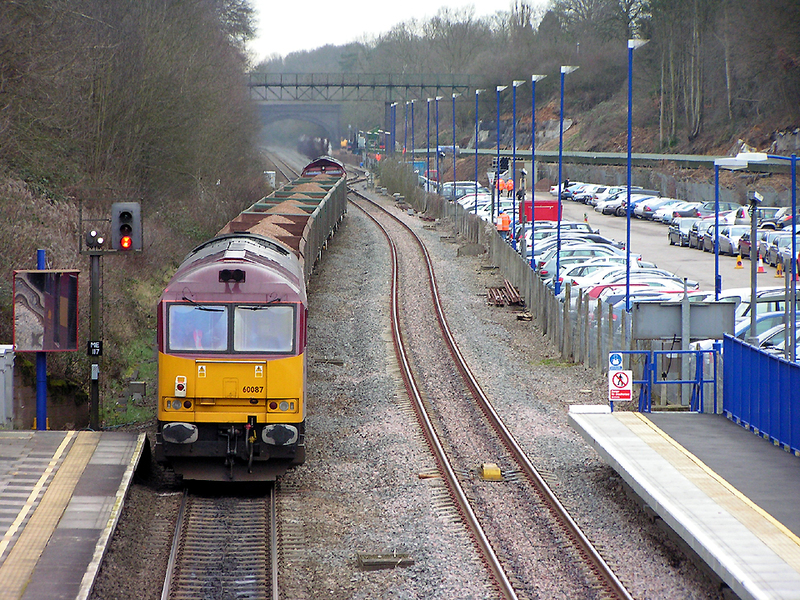 After this train reaches the end of the long siding, the gates will be shut and the short turn-back siding remains available. In the up direction, the new platform was originally just long enough to handle the 6 car rush hour trains made up of a 4 car 115 and a 115/108 pair; 2 x 4 car 115 sets which had been the rush hour norm had been lost some time previously. Later it was lengthened to handle longer 165 combinations. The foreshortening created by a long lens reveals the origins of the 2005 layout quite clearly. It also shows the Evergreen starting scenario with the base of the cutting, with its greenery, obscuring the down platform Most of the pictures of Evergreen work that follow are taken in this direction although without such a severe foreshortening effect. Note the 35/75 mph speed limit sign. Taken at 14.20 on Saturday 9th October 2010, so some 12 hours into the possession. Clearer pictures of some of the work taking place here follow, but this image gives an idea of the various activities in progress such as relocating the cable trough. The two wagons at the left were loaded with spoil, driven to the far end of the turnback siding and unloaded there. This equipment, caught on camera at about the same time as the previous image, is nailing the remaining cutting side to ensure its stability. Wikipedia has a desription of the technique at http://en.wikipedia.org/wiki/Soil_nailing which may be helpful. Which variant of the system was used here I did not stay long enough to determine. On the left 16th November 2010, and on the right 28th March 2011. To view this comparison, we have jumped over various events, which we will return to. 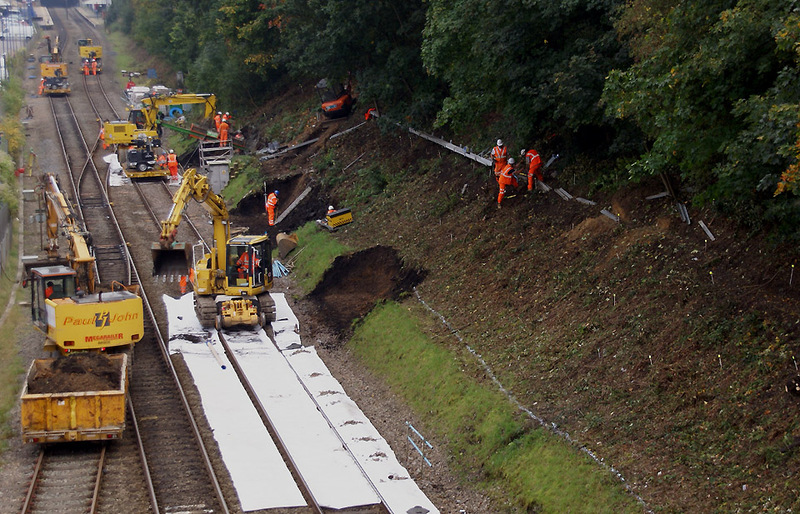 The excavation of the cutting and its nailing, have allowed the down track to be repositioned which in turn has allowed the up track to be moved. 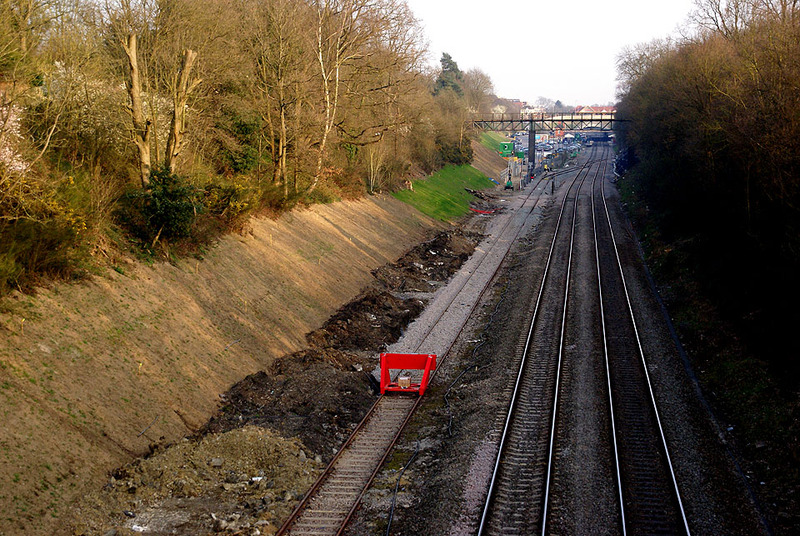 The down line has been repositioned and freshly ballasted. This is late Sunday afternoon and it looks as if the line will be ready for use, at the old line speed, on Monday morning - it was. The observers on the footbridge are greatly outnumbered by the orange-clad team. 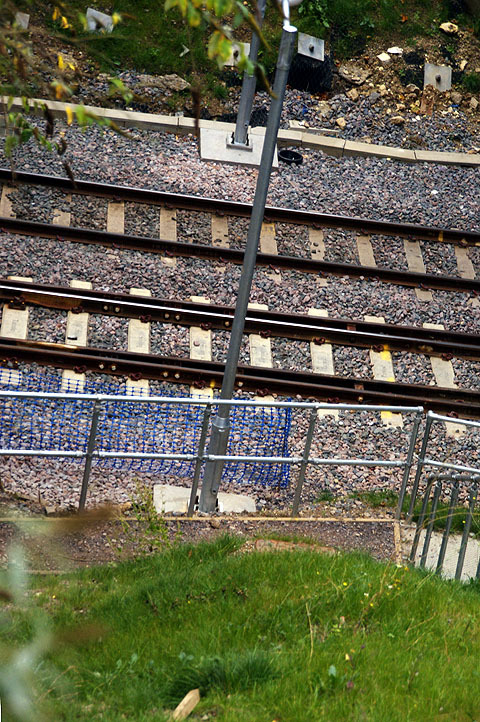 The crossover and therefore the turnback siding, are very clearly unavailable, but it is being used by contractor's equipment. Note that the high fence between the siding and the running lines is still in position.. There was a lull in the work to allow the timetable to be more shopping-friendly in the run up to Christmas. 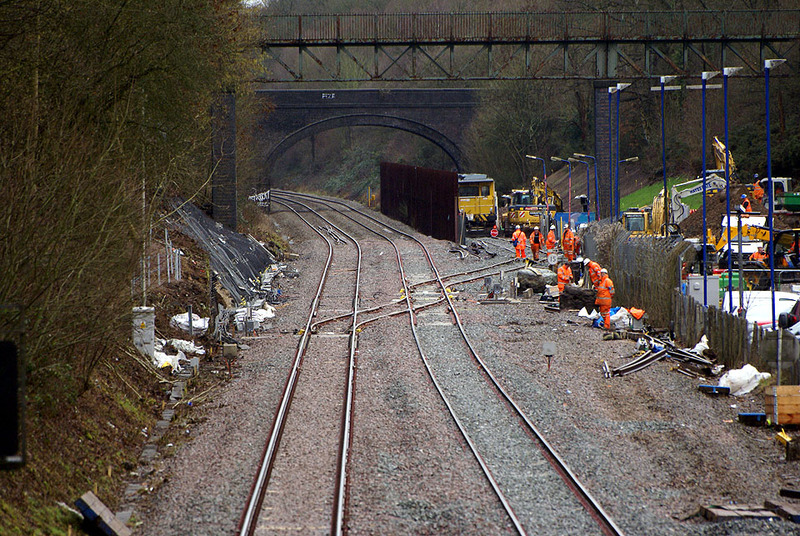 By Monday 17th January, the up line had been re-aligned and the crossover re-connected. There is still a lot to be done, but the main civil engineering is now complete. This view give a clear idea of the final mainline alignment. There are other changes that are not so obvious. 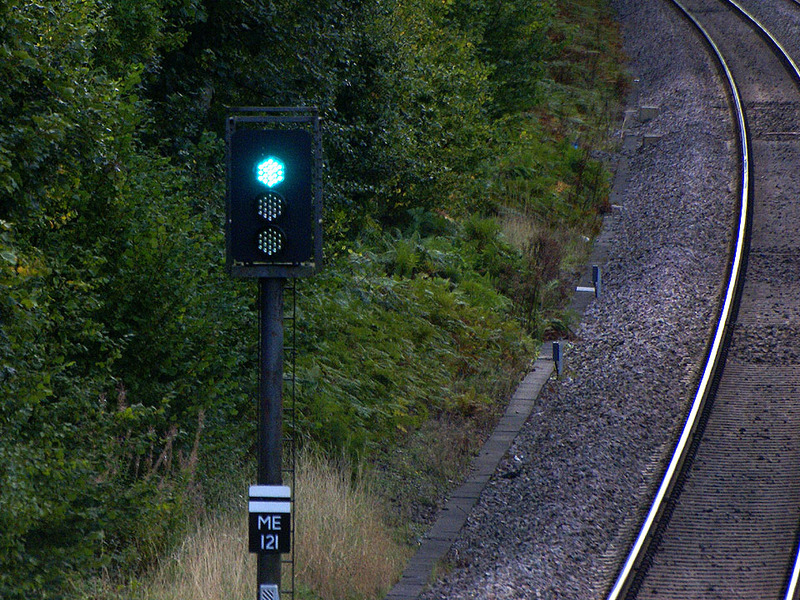 This signal controls the facing crossover which is mainly used to reach the turn-back siding, but the down platform line is now bi-directional so that up trains can pass anything standing in the up platform. 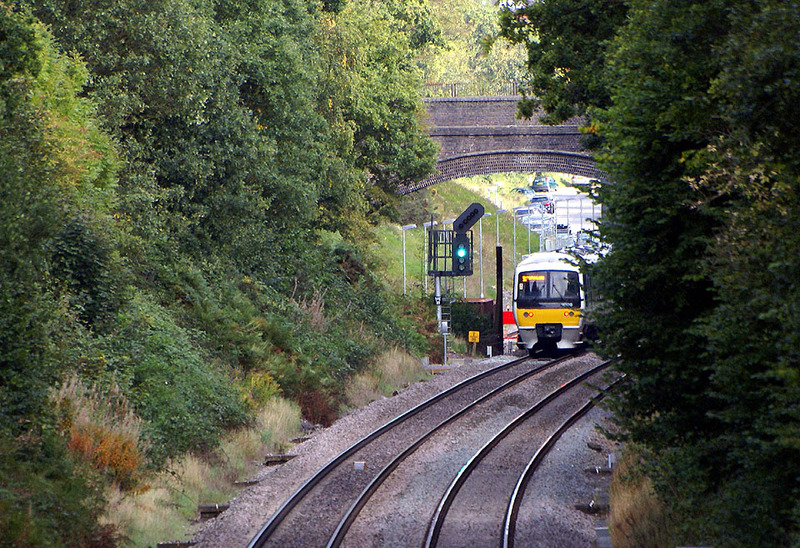 The trailing crossover which takes up trains using the down platform back on to the up line is hard to see, much of it being in the tunnel, and part of it under Marsham Lane bridge. Note it has its own street lights. This automatic signal and all the others in the area now have LED illumination. A final view showing the overall result, including the lighting of the turnback siding.